Mounting to a Picatinny rail. 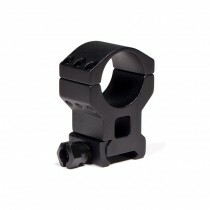 The wide, 6-screw Tactical ring offers solid support for 30mm riflescope tubes. Provides lower 1/3 co-witness on an AR15. This Vortex Tactical Ring positions the center of the riflescope tube at a height of 1.57 inches (40.00 mm) from the base. Sold one ring per package.